Ina, I love you. The Barefoot Contessa was the inspiration for my roasted brussels sprouts that we happily devoured for dinner a couple nights ago. Roasting these little powerhouse packages of nutrients gives them a whole new level of flavor; rich with a touch of sweetness. Lay bacon slices in a shallow baking pan (11×17) and bake until done. Remove bacon but leave enough bacon fat in the pan to coat the brussel sprouts. Spread brussel sprouts out evenly in pan, stirring to coat the sprouts with the bacon fat. Sprinkle with salt and pepper. Crumble bacon and stir into sprouts when they’re done. Next time, buy more sprouts! You can leave them whole, just cook another 15 minutes or so. 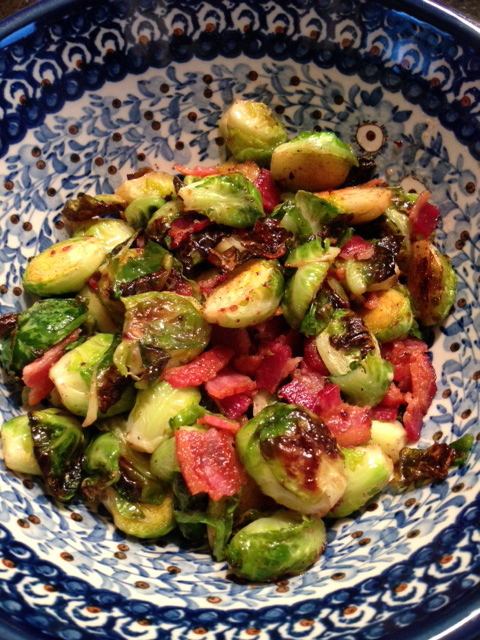 This entry was posted in Food, Low Carb, Recipe Box and tagged bacon, brussels sprouts, recipe, roasted vegetables. Bookmark the permalink.